Inspired by a Kim Little hat-trick, Scotland escaped from Ajdovscina with a convincing win despite a subdued opening Euro 2017 qualifier. The 25-year-old evaded her marker to chip the Slovenia goalkeeper and give Anna Signeul's side a half-time lead. Little scored twice more after the break, twice racing through on goal and rounding the keeper to tap in. They continue their campaign with an October double header at home to Belarus and away to Macedonia. As expected, Ifeoma Dieke, Rachel Corsie and, crucially, Little all returned to the side after being forced to sit out Thursday's 4-0 friendly defeat to Norway at Firhill. The late afternoon conditions were perfect as coach Signeul relied on most of the players who had fought the last World Cup qualifying campaign. Little, who plays for Seattle Reign, was just two minutes into her return when she landed on the wrong side of referee Sandra Bastos. The Portuguese official was unhappy when the midfielder took a free kick in a dangerous area outside the Slovenia box before she had authorised it - but the yellow card looked very harsh. The home side, who had lost 10 of their last 12 matches were happy to sit in and try to hit Scotland on the break, but neither goalkeeper was unduly tested in a sluggish opening. Beattie fired in a low 30 yard shot which was easily collected. It looked more promising when Little cut in from the left, but she fired well wide of the target. A disjointed Scotland performance finally brought a goal made in Seattle after 28 minutes. Another promising attacking move looked to have been cleared by Slovenia but the Scots got a second bite and Corsie's neat touch gave Little the opportunity to lob goalkeeper Sonja Cevnik. Slovenia had a great chance to equalise three minutes later. Lara Prasnikar beat Dieke on the edge of the box, but as she was about to shoot Jenny Beattie took the ball off her toes. Little, who was easily Scotland's best player, set up a great chance for Jane Ross after another fine run down the left, but the striker couldn't squeeze the ball past Cevinik. An unconvincing opening 45 minutes for the visitors ended with the Slovenian captain Mateja Zver springing Urska Zganoc behind the Scottish defence, but this time Hayley Lauder prevented her from testing Gemma Fay. Scottish nerves were finally settled three minutes into the second half. Little had already been caught just offside a couple of times before accepting Ross's pass and calmly rounding Cevnik before scoring her second. Little made it three, and a hat-trick, ten minutes later. She had already been involved in the move twice before Leanne Crichton provided the killer pass and Little again rounded Cevnik, this time on the other side, before shooting home. Despite posing almost no attacking threat, Slovenia were lucky not to pull one back in the 67th minutes. Zver's curling shot from just outside the box beat Fay but rebounded back off her far post. Anna Signeul: "I'm delighted. We came for the three points and we got them. Kim was very good. "It was the first game of the campaign and a very slow pitch. We just need to be patient in these games." 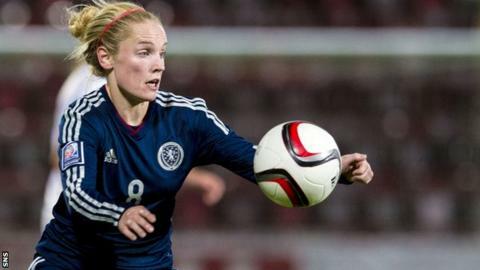 Kim Little: "It's always nice to score goals for your country, and to get another hat-trick is great. What's important is getting the win." Scotland: Fay, Dieke, Love, Lauder, Little, Crichton, Evans, J.Ross (L.Ross 81) Corsie, Beattie, Brown.